Our work would not be possible without help from our partners, our supporters, our members and our team. Thanks to the Gulf Restoration Network for their ongoing efforts to work with ABK to protect the Basin and Louisiana’s Coast. GRN has been critical in our efforts to monitor ongoing construction of the Bayou Bridge pipeline in and outside of the Basin. An issue of primary concern for ABK is lack of enforcement of permit conditions and failed compliance with permit conditions. Much of our work centers around these unfortunate yet reoccurring circumstances in the Basin. We work hard to hold not only developers but also regulatory agencies accountable to the letter of the law. This property in St. Martin Parish was cleared and the pipe laid without the authority from all owners. BBP sued the remaining landowners to acquire the rights to an easement across the property AFTER it had already cleared and constructed on the property. 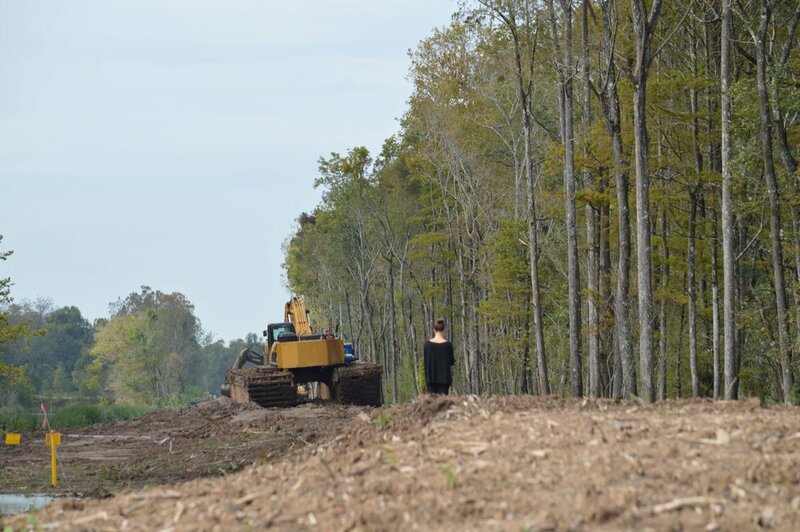 ABK continues to monitor construction of the Bayou Bridge pipeline across the Atchafalaya Basin. Our staff works hard to document and protect the Basin from lack of compliance with permits. GRN, ABK, and many other partners and concerned individuals notified the regulators at the outset of this potential pipeline project that the existing right-of-way was riddled with out-of-compliance, existing spoil banks. ABK’s attorney Misha facing a giant on the edge of the property. You may be asking yourself, “why is Atchafalaya Basinkeeper involved in a lawsuit filed against landowners?” It’s a logical question, but here’s why this matters. In this photo, you can see the existing spoil bank Scott (GRN) and Misha (ABK) are standing on. Also, notice that the pipeline markers have been placed in the existing spoil bank, which disrupts north-south flow of water, impedes navigation, and results in unsustainable deposition of sediment in this area and across the Atchafalaya Basin. taking. Unfortunately, in this case, Bayou Bridge entered, cleared, and constructed on the property before filing a suit against the landowners to prove it’s entitlement to use the extraordinary power of eminent domain (referred to in Louisiana as “expropriation”), and prior to paying just compensation to the landowners. A landowner who seeks to ensure that the project is in the public interest, and to require the company to make a showing of a public and necessary purpose for the project, and a determination of just compensation, has to risk being sued, going to court, and potentially losing, which would expose the landowner to possible costs of the case. But again, you may be asking, what does this have to do with the Basinkeeper’s work? ABK believes that the judicial question of whether a project proposed by a private company meets the requirement of fulfilling a public and necessary purpose should consider ALL of the project’s impacts, both beneficial and harmful, economic and ecological. While projects may purport to provide certain economic benefits, we believe that the harms to our state’s economics, restoration efforts, public health and safety, and well-being of our Atchafalaya Basin and Coast should be part of that determination. Atchafalaya Basinkeeper works diligently to promote enforcement and compliance across the Atchafalaya Basin and our Coast. If companies are allowed to continue to disregard permit conditions, expropriation laws, or private rights to property, to the detriment of the Basin and our Coast, we will all suffer. If our regulatory agencies continue to turn a blind eye to noncompliance, we will all suffer. This case represents a clear instance where the company made a business decision to violate the law, and trample over the rights of individuals in its path. ABK believes in the equal application of the law, and the protection of rights revered in U.S. and Louisiana since the inception of our constitutions. ABK has engaged in this effort to protect not only the ecological integrity of the Basin, but also the constitutional rights to property and fair enforcement of the law in Louisiana. We appreciate all of the support from our members, partners and donors, without which we would be unable to effectively protect the Basin and our Coast for future generations to enjoy.